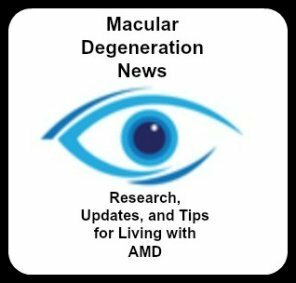 Dan Roberts, the Director of www.MDSupport.org and the author of The First Year: Age-Related Macular Degeneration: An Essential Guide for the Newly Diagnosed shed's some light on the topic of blue light, some of the hazards of this light spectrum and what lights may be harmful to the macula. Lighting needs constantly change as we age and as macular degeneration progresses. 1. Please explain to us what is blue light. Light is made up of electromagnetic particles that travel in waves. Light waves measuring approximately 470nm (nanometers) to 400nm in length are interpreted by the brain as the color blue. This is the high frequency end of the visible light spectrum, with the other end being red at about 650nm. 2. In what way is blue light helpful for visibility? The rod and cone cells in our retina are responsible for collecting light and transmitting it as nerve impulses to our brain. Recently, a subset of these cells, called "intrinsically photosensitive retinal ganglion cells" (ipRGC) have been discovered. These are thought to help modulate our circadian rhythms, and they have also been shown to control the dilation and contraction of our pupils. They seem to be most sensitive to blue light, and it is the pupil response that may be the reason our environment seems brighter when light peaks in that part of the visible spectrum. 3. How is it that blue light can be harmful to our eyes? Retinas compromised by disease are more at risk from light damage than healthy ones. Blue light, specifically light that is in the higher frequency nearing ultraviolet (UV), is not filtered well by retinal tissue that is weakened by genetic deficiencies, poor nutrition, polluted environments, health habits, and aging. We need, therefore, to protect our eyes from both UV and near-UV. To be absolutely clear, the research has not shown conclusively that blue light is any more toxic than the other colors. There is, however, enough evidence to cause concern. I, for one, prefer to err on the side of caution by taking simple steps to protect my eyes. 4. What lights or light bulbs are sources of blue light? Does that include full spectrum and Ott lighting? Full spectrum lighting peaks high in the blue range. The color temperature of light emission is measured in Kelvin (K) units. Sunlight at high noon is about 5000K. That is the lowest temperature that can be defined as full spectrum. It is very blue, which is why we tend to think full spectrum is brighter, when it is not. Actually, when compared side-by-side with a white light source, it can appear to some people as dimmer and more glaring. We are told by our physicians to protect our eyes from the sun. Then that same physician will tell us to buy a full spectrum lamp and place it on our desktops. That never made sense to me. Lighting is a very personal choice. What may be good for one person may be insufficient for another. I tend, however, to opt for safety over objectivity. First, I make sure the lamp is rated somewhere in the whiter range, between 3600K and 4800K. These lamps will be labeled "warm white". Next, I pick wattage that is high enough to see well by, and then try to include a dimmer so it can be adjusted to my changing comfort levels during the day. Placement of the lamp is also important to avoid glare and reflection. 5. Explain how cataract surgery can diminish our protection from blue light. As we grow older, our natural lenses yellow, which helps filter blue light. Cataract surgery replaces the natural lens with a clear one, which removes that little bit of protection. To counter this, tinted lenses are available, but then we may be making things worse by decreasing our dim light vision. It might be better to wear tinted glasses, which can be removed when necessary. 6. How can a person protect his eyes from blue light outdoors? Amber blocks up to 80% of blue light, and the closer the tint leans toward red, the more it filters. I prefer amber when I want to see natural colors, but if I'm in bright sunlight for a period of time, I change to a dark red-orange. One should not drive, by the way, while wearing 100% blue blockers. 7. How can a person protect their eyes from blue light indoors? Don't bring the sunlight into the house by buying full spectrum lamps. Other than that obvious precaution, unless the person is staring at the sun through a window, there is little reason for concern. The intensity of blue light emissions from appliances, televisions, and sunlight reflected from diffuse surfaces, is not enough to worry about. 8. What lighting have you found works the best for you for performing tasks or reading? The brighter and whiter, the better. Brightness is important, because my degenerating photoreceptor cells just don't work as well as they should. Whiteness is important, because the whiter the whites and the blacker the blacks, the better contrast sensitivity I have. I also depend on dimmers on all of my task lamps to adjust my comfort level. I see better in the morning, for example, but I need more brightness as the day wears on. 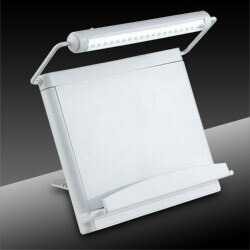 I would like to repeat that a person should shop around and compare to find the best lighting for his or her needs. There are many variables among us to say what is best, but we do have some pretty good arguments for avoiding high intensity blue light for long durations. As long as we are aware of the pros and cons, we should be able to use any light source we like. To be honest, if anything is going to make my sight worse, it's probably going to be the hamburgers and french fries, not the color of my wallpaper.